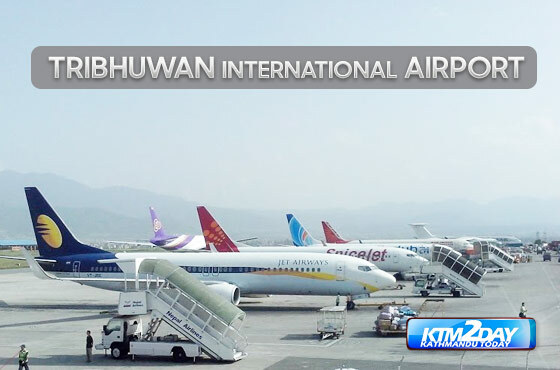 Tribhuvan International Airport (TIA) handled more than 10,000 travellers daily in 2017, making it the busiest year for the country’s sole international aerial gateway. International air passenger traffic continued to record double-digit growth in 2017, registering a 10.74 percent increase over the previous year despite infrastructural hurdles, said TIA. A record 3.88 million passengers passed through TIA last year. International air passenger traffic through TIA plunged 8.37 percent to a 13-year low of 3.21 million in 2015, as travellers stayed away due to the April earthquake. However, in 2016, passenger traffic swelled 9.12 percent to 3.51 million. This means 91 international flights on average took off and landed at TIA daily last year. In 2016, there were 75 take-offs and landings daily. The country’s only international airport has been facing severe congestion over the past few years with more and more Nepali migrant workers, students and tourists travelling in and out of the country, but the infrastructure has not changed from where it was two decades ago. Almost 10 years have passed since a project was launched to expand TIA. Various drawbacks have delayed the completion of the first phase of the TIA improvement project. The completion date for the project has been pushed back to 2019 due to the tardiness of the contractor. After the completion of the project, TIA will be able to handle more than 5.85 million passengers annually and accommodate bigger aircraft. Moreover, Nepal Airlines will be launching new services with two wide-body Airbus A330 jets this year. Private carrier Himalaya Airlines is also planning to connect several Chinese cities this year. “With these developments, we expect passenger traffic to rise by double digits this year too,” said Chettri, adding that the industry would have to wait for at least a year to get new facilities like parking bays, new conveyor or luggage belt and other facilities. The growth in tourist numbers is likely to swell over the million mark this year, according to industry watchers. They expect the year 2018 to see a boom in Chinese tourists with the left alliance in government. Arrivals from the southern neighbour are expected to increase as well given the current flight frequency. A breakdown by airlines shows that Indian Jet Airways topped the list of carriers with the highest number of passengers. It flew 469,301 passengers, up 40.43 percent year-on-year. It currently has five flights daily—three on the Delhi-Kathmandu and two on the Mumbai-Kathmandu sectors. Nepal Airlines slipped to second position with its passenger carriage growth reaching a meagre 1.04 percent after the carrier put one of its two Boeing 757s on auction last year. It flew 388,329 passengers during the review period. Doha-based Qatar Airways saw its passenger numbers drop 9.90 percent to 307,923 individuals. Low-cost carrier Air Arabia slipped to fifth with a negative passenger growth of 15.44 percent. The airline flew 287,617 passengers in 2017. India’s flag carrier Air India saw a 13.81 percent growth in passenger carriage to 208,367. Dubai-based low-cost carrier Fly Dubai also saw a negative 9.16 percent growth as it received 293,083 flyers. Himalaya Airlines jumped to the seventh spot recording a strong 421.58 percent passenger growth last year. It flew 179,893 passengers. China Southern recorded a strong 186.55 percent growth attracting 126,036 flyers. Likewise, Thai Airways saw its passenger carriage grow 1.01 percent to 170,365. Malaysian-based low-cost airline Malindo posted a strong growth of 92.90 percent. It flew 162,620 passengers last year. However, another low-cost carrier Air Asia X saw its passenger numbers plunge 42.55 percent to 97,991 last year, as per TIA statistics.